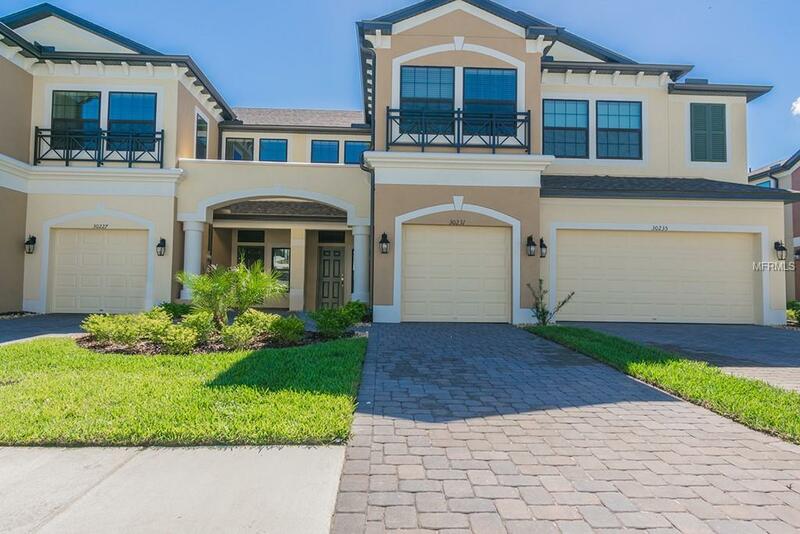 READY NOW - Windermere Estates is tucked away in the heart of Wesley Chapel just minutes away from shopping, hospitals and highways. It is a luxury, gated town home community providing a maintenance free environment. This is a fantastic 2-story, 3 bedroom floor plan with a completely open concept downstairs. Through the front door is a small foyer with an open great room, half bath is tucked away on the side next to the single car garage entry and coat closet. The kitchen is in the back and features Granite counter tops, stainless steel appliances, 42 cabinets with crown molding and a huge walk in pantry under the stairs. Downstairs is complete with ceramic tile, and a spacious screened in lanai through the dining room. Upstairs you will find the master suite, complete with a huge walk in closet. The master bath is spacious with a dual vanity and large walk-in shower. Down the hall is a full laundry room across from a small bedroom / den and on the opposite end is a large 2nd bedroom with walk in closet and the 2nd full bathroom. This is a great floor plan to fit your needs! Contact us today to schedule a tour and come and see it for yourself! Please note that pictures shown actual are of builders model and are for INFORMATIONAL PURPOSES ONLY.